Herbs have been used for thousands of years, both medicinally and ritually. Every herb has its own unique characteristics, and these properties are what makes the plant special. Subsequently, many Pagans use herbs as part of their regular ritual practice. Whether it's for money and prosperity, protection, healing and wellness, love and lust, there is almost always an herb associated with your purposes. So, now you've decided you're ready to do a magical working... but you're not sure which herbs are the best ones to use. Use this list as a reference point to determine which herbs, plants and flowers are the best choices for your magical intent. There are a number of herbs associated with matters related to money. 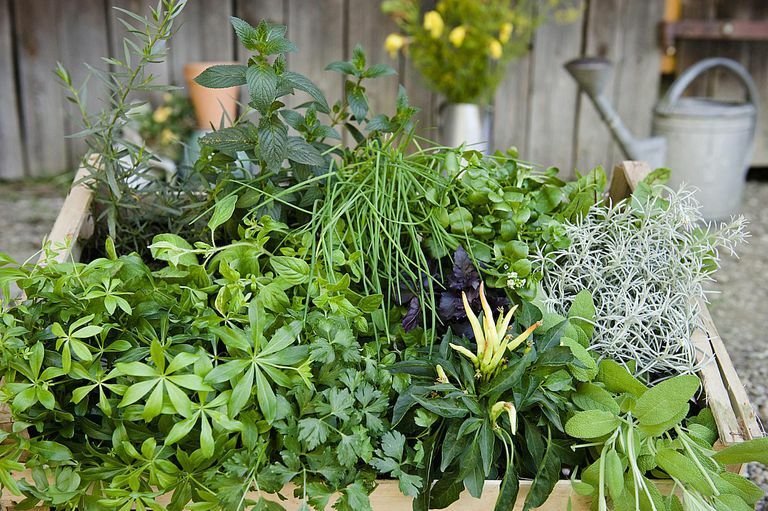 Whether you're looking to boost your financial wherewithal, land a new job, or just pad your bank account a little, try some of these magical herbs in your money-related workings. Hawthorn: The hawthorn tree is associated with power and masculine energy. Tuck a couple of spikes into a safe spot in your desk to give you a little magical boost at work. Sandalwood: If you have professional goals you hope to meet, write your intent on a chip or stick of sandalwood, and then place it in a brazier to burn. As your sandalwood burns, your goal will be carried up to the heavens on the drifting smoke. Basil: A freshly potted basil plant in your workplace can help to guarantee courage in facing business challenges. Frankincense: Carry a few bits of resin in your pocket when you go to a business meeting or interview for a successful outcome. Bay Leaf: Is there a promotion you'd like to get, or a new job you've applied for? Write your intent on a bay leaf, and carry it in your pocket. Bergamot: Slip a few leaves into your wallet to attract a higher-paying job, or rub it on the money you currently have to ensure that it will return and multiply. Pecan: Keep a pecan in your pocket when you go to a job interview to ensure success. If you have a job but are concerned about losing it, bake yourself a pecan pie to help you keep your job. Money/prosperity: Money magic is one of the most popular uses of magical herbs. If you want to bring money your way, try a few of these herbs. Be sure to also read about simple money folk magic spells! Bay leaf: Use in incense blends for money spells to bring a few extra dollars your way. Basil: Crush up the leaves and sprinkle around your home to bring money towards you, or use them in a Money Mojo Bag. Chamomile: Brew a batch of chamomile tea and sprinkle it around your property to draw money towards you. Clover: Carry a clover in your wallet to bring money your way, or plant it around your house to bring all-around prosperity. Tonka bean: In many forms of folk magic, tonka beans are carried on your person to draw financial abundance your way. Pennyroyal: If you own a business, place a sprig over the door to draw in customers and prosperity. Try making a bar of Money Soap to wash your hands with, or use Pennyroyal to brew up some Prosperity Oil. Hazel: Carry hazelnuts in your pocket to draw good fortune your way, or hang a bough of hazel branches above your door. Holly: Make wreaths and boughs of holly to hang around your house, inviting good luck into your home. Pomegranate: Use pomegranate seeds in dessert and drinks to bring about prosperity and abundance. Snakeroot: In some forms of folk magic, snakeroot - a folkloric name for black cohosh - is used to get rid of bad luck that may have been inflicted upon you magically. Use it around your home to eliminate negative fortunes. Sunflower: Planting sunflowers around your home and garden will bring fortune your way. It is also said that if you pick a sunflower at sunset, then wear it on your person, it will bring you good luck the following day. Clover: Clovers and shamrocks are a well-known symbol of good luck - carry one in your wallet! Gambling/games: Are you a fan of gaming and gambling? Use some of these magical herbs to bring you success with cards and dice! Chamomile: Wash your hands in chamomile tea to ensure good luck at the gaming tables. Buckeye: Carry a buckeye in your pocket to bring you success in games of chance - or bake a batch of buckeye candies to eat beforehand! Chamomile: Bathe in a chamomile wash before going to court to ensure a favorable outcome. Ginger: Chew a bit of ginger as you walk into the courtroom, and discreetly spit a bit of the juice on the floor, to bring about a fair and just decision. High John Root: Carry a bit of High John in your pocket to sway a court decision your way. Many Pagans - and others - use herbs as a tool in the magical arsenal. While not every herb is safe to ingest - and be sure to read about Dangerous Herbs before you get started - many of them are used in a magical or folkloric context to bring about healing. If you're interested in healing magic, here are some of the most popular healing herbs to keep on hand, and how you can use them. Please do keep in mind that if you're going to use herbs internally - such as a tea or tincture - it's always a good idea to check with your physician first. There are some medical conditions that contraindicate the use of various herbs, so do your homework before you begin. In addition to those listed below, be sure to read about 9 Healing Herbs for Your Magical Medicine Cabinet. Valerian: Valerian can be brewed into a tea to help alleviate anxiety. Lavender: Place sprigs of lavender under your pillow to help relieve stress. Rosemary: Make an astringent out of it and use it as a skin wash to clear up your complexion, a soother for eczema, or one of these other healing methods. Witch Hazel: Use as a topical astringent for your skin, and in workings that will help others see your true beauty. Catnip: Rub catnip leaves on your skin to freshen it (although you may want to avoid this if you're allergic to cats), or burn it incense for workings related to beauty. Ginseng: This root is typically associated with male potency - if you want a man to see how beautiful you are and bring him to you, use ginseng in your magic. Dandelion: Use dandelion heads and leaves in incense for healing rituals focusing on depression. Honeysuckle: Associated with willpower, honeysuckle can help give you the extra inner strength to fight depression. Lavender: Lavender is popular in aromatherapy - inhaling its fresh scent, or a few drops of oil, can help calm an anxious or nervous mind, as well as providing headache relief. You can also try one of these healing methods. Apple Blossom: Make a vinegar infusion with the blossoms, and use it to treat itchy, painful insect bites or stings. Here are some more healing ideas for apple blossoms. Comfrey: Brew a comfrey tea to help with general healing, or use a juice from the pressed leaves for a poultice for minor cuts and abrasions. Eucalyptus:Warm the leaves or oil, and inhale the vapors to clear clogged sinuses, stuffy noses, and other upper respiratory issues. Read more about the healing properties of eucalyptus. Chamomile: Brew into a tea to aid in problems such as morning sickness, digestive disorders, gastritis, and difficult bowel movements. Read more about the healing properties of chamomile. Goldenseal: Keep goldenseal handy in your medicine cabinet to clean out minor wounds and abrasions. Here are some additional uses for goldenseal in healing. Feverfew: A decoction sweetened with honey or sugar is sometimes used to relieve light coughing or wheezing. It's a great herb to use externally as well - make a tincture or ointment to apply onto insect bites to relieve itching or swelling. For more healing ideas, read about Feverfew. Sandalwood:The wood can be ground down into a fine powder, and used for beauty treatments - add a bit of rose oil or camphor, and apply it to your skin for cleansing. Read more about the healing properties of sandalwood. Peppermint: Peppermint is good for the skin - rub the leaves on yourself to freshen up. You can also chew them for a quick tooth-cleaning. Use the dried leaves in incense for workings related to healing magic. Mugwort: If someone has overactive dreams, they can be balanced out with a ritual bath made from mugwort and indulged in prior to bedtime. Lavender: Keep a lavender sachet under your pillow to help with restless sleep. Rosemary: Pot some rosemary and keep it by your bed, or use a bit of the essential oils in workings related to better sleep. Thyme: Thyme can be used in healing rituals, or to bring about restful sleep. There are a number of herbs and plants associated with magic relating to love, lust and friendship. Try some of these in your magical workings. As always, if your tradition forbids the use of love magic, then don't use it. Orange & Lemon: Make a sachet of dried orange or lemon peels, or use them in a potpourri, to strengthen the bonds of friendship. Sweet Annie: Burn sweet Annie in incense to help repair a damaged relationship with a friend. Vanilla: Use vanilla bean in rituals and workings having to do with forming new friendships. Apple Blossom: Add apple blossoms to teas, incense or potpourri when working on love magic. Bleeding Heart: Plant bleeding hearts around your front door to invite love into your home. Lavender: To bring love your way, carry lavender flowers in a sachet on your person, or hang stalks of it in your home. Periwinkle: Include periwinkle flowers when making love magic poppets. Tulip: Wear a tulip close to your body if you know you'll be around the person you're in love with, and they'll be more aware of you. Violet, Daisy & Daffodil: Make a garland to wear in your hair, or carry a bit of violet, daisy or daffodil in your pocket to attract a new lover. Yarrow: Yarrow is associated with Venus and Aphrodite - use it in rituals in which you call upon deities of love for assistance. Allspice, Cinnamon and Clove: Blend allspice, cinnamon, and/or cloves into a cake for someone you're attracted to, and it will help draw them closer. Ginseng: Carry ginseng with you to help improve sexual potency. Dill: Add dill seed to a bath before you get together with someone you're lusting for, for a little magical push - don't use too much, or you'll smell like pickles! Vanilla: A bit of vanilla dabbed behind your ears makes you irresistable to those you want to want you. Yohimbe: Use to cure impotency, or to attract new sexual partners. In many magical traditions, workings can be done to ensure protection of home, property, and people. There are a number of simple ways you can do protection magic involving herbs and plants. Aloe Vera: Keep potted aloe plants in your home to protect the inhabitants - it's said that aloe will keep you safe from common household accidents. Violet, Thistle, Honeysuckle, and Fennel: Plant these herbs around your home. When they bloom, harvest them and hang them up to dry. Use the dried herbs in protective sachets or incense. Hyssop: Carry some hyssop in your pocket, or spread it around the perimeter of your property to add a layer of magical protection. Asoefetida: Use asofetida in incense during protection rituals. Mandrake: Plant mandrake around the perimeter of your property as a barrier, or place some under your doorstep for protection. Use as a magical poppet for self defense. Heather: Use heather in a dream pillow if you feel you might be under magical attack. Holly & Mistletoe: Plant holly around the perimeter of your property for magical protection, or hang mistletoe over your doors and windows. Mugwort: Place mugwort under your pillow to prevent astral attacks, or to ward off psychic attacks from those who would do you harm. You can also use it to make protection oil. Onion: Make an Onion Braid protection charm to hang in your home to protect those who live there. Cedar: Carry a bit of cedar in your pocket when you're facing new challenges, to help boost your courage. Mullein: Use mullein in a sachet or incense blend for workings that you'll need extra courage for. Tonka Bean: A Tonka Bean carried on your person will help improve confidence, especially if you're facing a legal issue. Cinnamon: Tie a pair of cinnamon sticks together, and place them under your bed or carry them with you. Oak & Acorns: Carry an acorn in your pocket for strength and power, or plant an oak tree in your yard to help give you extra strength. Bay Leaf: Place a bay leaf in your shoe to help you walk with confidence and show your inner strength. Thistle: Carry a bit of dried thistle in an amulet or talisman, or burn it in rituals that relate to developing your emotional and mental strength. Sage: Although typically associated with cleansing and purification, sage can also be burned during divination sessions for an added magical boost. Tobacco leaf: In some magical traditions, tobacco leaf is burned in rituals related to divination. Jasmine: Burn some dried jasmine in your bedroom as you sleep to help with divinatory dreams, or if you're stuck at a crossroads in decisionmaking and need your intuition to guide you. Mugwort: Place a few sprigs of fresh mugwort under your pillow to bring on prophetic dreams. Heliotrope: Associated with the sun, heliotrope can come in handy in rituals focusing on prophecy, in divination rituals, or even to call upon solar deities for guidance. Rowan: Use the wood of the rowan tree to make a divining rod or wand, or carry the leaves and berries in an amulet to help develop your own psychic skills.